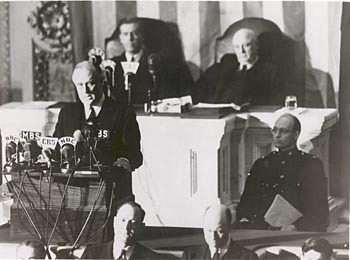 Franklin D. Roosevelt delivers his “infamy speech”, declaring the United States’ entry into World War II following the attack on Pearl Harbour. The 17 February 1941 issue of Life magazine saw the publication of editor Henry Luce’s article “The American Century.” The title of that article has become shorthand for the American global dominance that followed World War II. In the article, Luce called for an expanded world role for the United States and the development of a truly American internationalism, which he claimed would make up for the mistaken rejection of American global responsibility in 1919. Luce outlined four ways in which the twentieth century would become the American Century. The article focused, like most Americans did at the time, on events in Europe. However, while references to Asia were limited, there were enough to reveal Luce’s own deep personal interest in Asia, and China in particular. In the context of the war, Luce referred to the recent Japanese invasion of French Indochina. With regard to trade, Luce noted the greater untapped potential of Asia. While Asia was worth only “a few hundred millions a year,” it could in fact represent billions of dollars of trade. Given Luce’s background and personal history, his interest in Asia was no surprise. The son of missionaries, Luce was born in China, and a visit to China in the 1930s only reinforced his interest in the country. As Robert Herzstein has argued, Luce’s worldview was a result of two forces: “Protestant Christianity” and “a fervent faith in America’s God-ordained global mission in Asia.” He believed that Asia, not Europe, represented the future for American development. With more people, and more untapped economic potential, Luce saw Asia as more important than Europe even as France fell in the summer of 1940. Luce was not the first American to be fascinated with Asia. Both the United States as a nation and independent American citizens had been deeply interested in Asia through the nineteenth century. From the early years of the republic, missionaries had sought “civilising” influence there. In the years after the Civil War, the United States looked to secure economic interests in Asia, and an open door to China in particular. The United States secured the Midway Islands, American Samoa, and Hawaii to help ensure future access to China, Japan and Korea. And war in 1898 saw the United States take the Philippines as an imperial possession. But while that use of hard power was in part to ensure other great powers did not step in to take the Philippines, other longer term factors lay behind the American interest in Asia. Those cultural and economic factors resurfaced as the threat of war loomed again in the late 1930s. Of course, Luce was not alone in showing an interest in Asia as war clouds moved closer to the United States. Other Americans shared an interest that was overshadowed by closer connections to Europe. One notable group was the American Committee for Non-Participation in Japanese Aggression (ACNPJA). Established in August 1938, it sought to limit the ways in which the United States directly and indirectly assisted the aggressive Japanese war effort through an embargo. In terms of personnel, the initial driving force was missionary Harry Price. Of great significance as the Committee developed was its President, former Foreign Service member Roger Greene. The arguments of the ACNPJA share the cultural, religious and economic concerns of Luce and reveal many of the same motivations for American action in Asia. The work of the American Committee for Non-Participation in Japanese Aggression reveals that despite the emphasis placed by historians on the war in Europe, American internationalism on the eve of World War II had an Asian dimension. The American internationalism promoted by the ACNPJA consisted of a number of elements that reflected the personal histories and background of the organisation’s key leaders, in addition to core elements of American history and the nation’s relationship with China. Notably, the organisation shared Luce’s interest in cultural leadership and democratic ideals, economic interests, and also his religious drive. While other religious leaders remained at the pacifist end of the peace movement, ACNPJA leaders put religion at the heart of their internationalism. The justification they used in promoting an embargo was closely related to religious themes, as they utilized moral arguments about foreign relations. Such arguments could be seen in Christian Hands of America, a pamphlet directly targeted at churches. It emphasised America’s historic ties to China, the vast scope of the Christian movement there, and the Christian leadership of the Chinese government. It highlighted how the issue of guilt in the Sino-Japanese war was so clear that “the American people and above all Christians of America can no longer escape making a decision one way or the other” about the need to take a stand. In the end, the arguments of the ACNPJA had a limited effect between 1938 and 1941. Ultimately, hard power from Japan drew the United States into World War II. Yet war with Japan drew the United States into Asian affairs more than ever before. 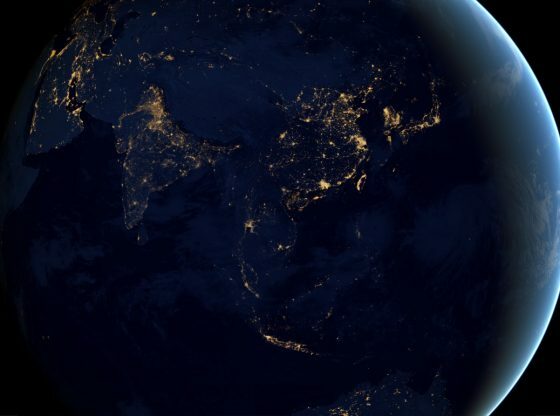 The future potential of Asia combined with the truly American internationalism that developed through the war meant that Asia became a key part of the American century. The threat of communism ensured that the United States would become entangled in Asian wars throughout the next three decades. But while the need for hard power revealed the limits of soft power, it was the soft power issues of trade, culture and religion that need to be understood to explain American interest in Asia in the first place. Andrew Johnstone is an Associate Professor in American history at the University of Leicester. He is the author of two books: Against Immediate Evil: American Internationalists and the Four Freedoms on the Eve of World War II (Cornell University Press, 2014) and Dilemmas of Internationalism: The American Association for the United Nations and US Foreign Policy, 1941–1948 (Ashgate, 2009). He is also the co-editor (with Andrew Priest) of US Presidential Elections and Foreign Policy: Candidates, Campaigns, and global politics from FDR to Bill Clinton (University Press of Kentucky, 2017), and (with Helen Laville) The US Public and American Foreign Policy (Routledge, 2010). His articles have appeared in Diplomatic History, Global Society, the Journal of American Studies, and the Journal of Transatlantic Studies. He tweets @HistoryAndrew. This article forms part of the IAPS Dialogue series on America in the ‘Asian Century’, a symposium joint-funded by the Department of American & Canadian Studies, and the Institute of Asia & Pacific Studies at the University of Nottingham. Image Credit: CC/ Wikimedia Commons.